Around AD440 St Patrick, patron saint of Ireland settled in this valley, where the rushing sound of the Bonet’s rapids and waterfalls fills the air. During the following 17 years he founded a Church, Monastery, and Nunnery, but little is left of the ancient ruins – only a few stones of what is thought to have been the church. Dromahair, which means “The ridge of the air demons”, then became the seat of the O’Rourkes, one of Irelands most powerful families. 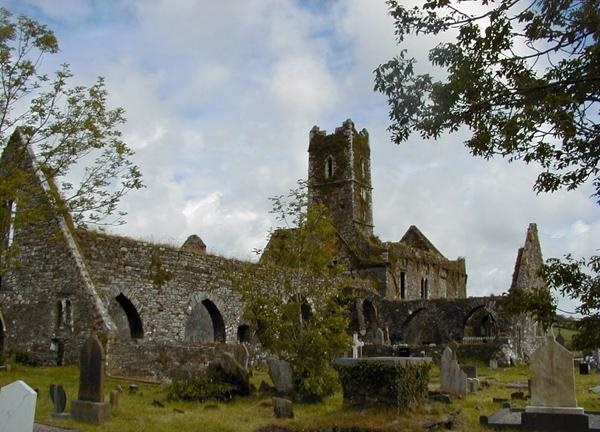 In 1152, Dervorgilla, wife of the one eyed Tiernan O’Rourke, Prince of Breifne, was abducted with all her cattle and possessions, while her husband was on the pilgrimage to St Patricks purgatory in Lough Derg. Her abductor was Dermot Mac-Murrough, King of Leinster. Thomas Moores ballad The valley lay smiling before me tells of Tiernans homecoming and his dismay as he approached his castle and saw no light in his wife’s window. 14 years later Tiernan and his neighbouring chiefs dethroned Dermot and banished him from Leinster. Dermot appealed to Henry II of England to help him regain his Kingdom, and enlisted the support of Strongbow - Richard de Clare, Earl of Pembroke. He was lured with the promise of marriage to Dermot’s eldest daughter and the whole of Leinster on his death. Strongbow landed in Wexford in 1170, together with a group of Anglo-Norman Barons who had been promised Wexford and neighbouring lands. So began the Anglo-Norman conquest of Ireland. Dervorgilla was eventually returned to O’Rourke castle but went straight to Mellifont Abbey in County Louth, where she died aged 84. Despite the Anglo-Norman invasion, however, the lordship of the O’Rourke’s lasted until the conquest by Elizabeth I. The O’Rourke’s finally lost all power after the Battle of Kinsale, in 1601. Sir William Villiers was granted 11,000 acres in the area in the 17th century and demolished the O’Rourke castle to provide the stone for all grandiose fortified house, The Old Hall, completed in 1626. Today only the banqueting hall and walls remain. Opposite this building, on the other side of the River Bonet, stand the remains of Creevelea Franciscan Friary. It was founded in 1508 by Margaret, wife of Owen O’Rourke, and was last to be built before the suppression of the monasteries. The transept, east window and remarkable small cluster can still be seen, as can the kitchen and refractory, in the north wing. Among the stone carvings are St Francis preaching to the birds, and another showing the Saint with the Stigmata. In the ground are the tombs of many of the O’Rourke. The monastery was probably finally abandoned at the end of the 17th century. It is now a national monument. The River Bonet is renowned for its salmon and trout, and the countryside around the town is ideal for hill climbing, cycling and pony trekking. In particular, a demanding climb to O’Rourke’s Table, a flat-topped hill covered with ferns and mosses, rewards walkers with panoramic views of mountains and valleys. Dromahair is a hidden gem that is a must see attraction on your tours of Ireland.